Previously in the Architecture Practice: Chief Architect Herbert Birchbranch (called Herb in the text) implemented the concept of “Architecture fashion light,” as a mechanism to take care of the issue of limited architect capacity under a heavy change load. After 14 months in his role as Chief Architect, Herb felt that he had to take care of another issue, the long-term steering of architecture development. The focus so far had been to set the architecture procedures in place along the project process, and to define a couple of services that the Architecture Office provides in addition to that. The need for long-term steering was driven by the fact that the IT platform, as a whole, really needed a strategic change plan. Another driver was the need for several architecture products, irrespective of the extremely limited capacity. To put it simply, a long-term pro-active plan was required for the architecture development. On a Monday morning, late in March, Herb sits down and starts to think about a model that can provide a long-term architecture development plan. He reads up some literature and, finally, finds the right mechanism – the Architecture Quarterly Plan (AQP). As part of this simple approach, you set up a three-year plan with quarterly details. Each essential architecture area shall have a development roadmap in this plan. Herb creates a diagram to reflect the idea, with the following result. The next step is to validate the model. Herb already has a meeting booked with the Application Management Expert David Caussin and Business Architect Barb Lane. The objective of the meeting is to discuss the architecture’s role in portfolio steering. At the meeting, Herb shows the AQP model with architecture area examples, such as Document Management, Enterprise Search and Geographical Positioning. David and Barb look confused. Then, David says, “It is too technical.” “Too technical … is it?” Herb thinks. He asks David what he means, and understands that it should be related to some kind of a business driver or initiative. “OK, I have to check with Peter, our IT strategist, to see if he has an actual strategic plan that the AQP can relate to,” Herb says. They agree to meet again next week. Herb, then, walks directly into Peter’s office. He is in and has time for a chat. Herb asks about the IT strategic plan that, he knew, Peter has been working on. “I have a first draft ready,” he replies. They look at the IT strategic plan draft together and Herb spontaneously exclaims, “Perfect, this is what I need.” The plan is simply a construction of IT strategic focus areas containing initiatives, placed in a timeline. Herb takes the actual draft of the IT strategic plan back to his office. He walks through the Strategic Focus areas, one by one, mapping architectural areas to the planned Initiatives. He then consolidates the Architectural Areas into one view, defining the latest (required) end quarter. 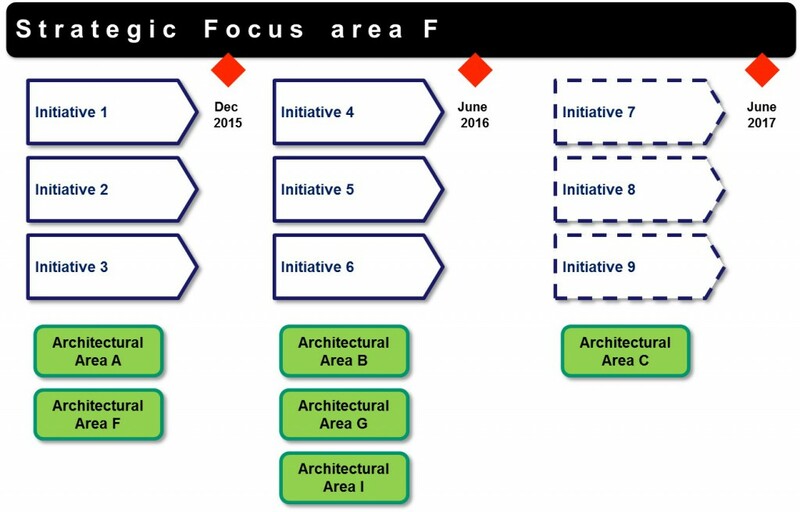 Each Architectural Area is then broken down into a roadmap, based on the pre-defined standard steps. The first draft is now ready. The development and realization of architecture has now been mapped into a long-term plan, based on the “Just Enough – Just in Time” principle. An important lesson learned was that the roadmap for each Architecture Area contains a different set of standard steps, depending on its current status and characteristics. A quarterly architecture plan provides adequate details for long-term planning. The overall three-year plan gives a good overview of the architecture production plan. To create confidence in the architecture plan, its content shall be based on and synchronized with business initiatives. 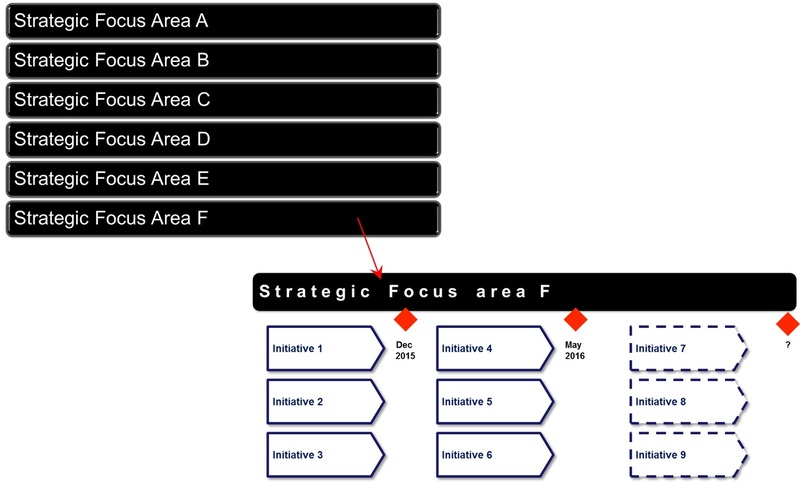 To secure right focus and prioritization, it should, as far as possible, relate to a strategic business plan.